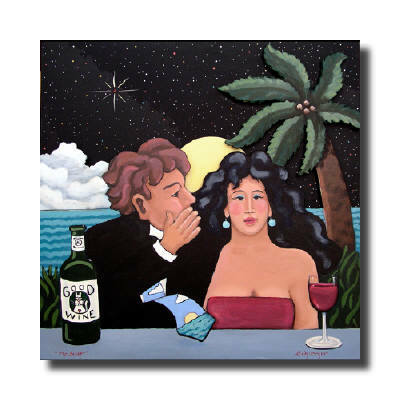 The Secret, oil on panel, 24" x 24"
John has a BA from Western Michigan University. After graduating, he began carving wooden signs which decorate many homes and businesses in Northern Michigan. John also carved wooden sculptures which ended up in five foreign countries. He then developed a line of ceramic jewelry which was sold in boutiques and galleries throughout the United States including Disneyland. At the same time he reinvented the art of lithophane which creates a picture by light shining through porcelain. The thinner the translucent porcelain, the more light shines through creating a modeling effect which reveals the picture. The next stage of John's evolution in art was the woodblock print also known as woodcuts. After thirty years and many awards for his woodcuts, he is now displaying oil paintings which he has been developing "behind the scenes" so to speak. He has already won several awards for his paintings. John lives in Fairfield, Iowa with his wife, Ann. They have a daughter, Maria, living in New York City. John writes, "My paintings represent my effort to bring beauty to the eye and harmony to the heart."